Cold and rainy weather did not deter the over eight hundred guests from attending Hannibal-LaGrange University’s 73rd Annual Booster Banquet featuring guest speakers Jim Bob and Michelle Duggar, stars of TLC’s 19 Kids and Counting. 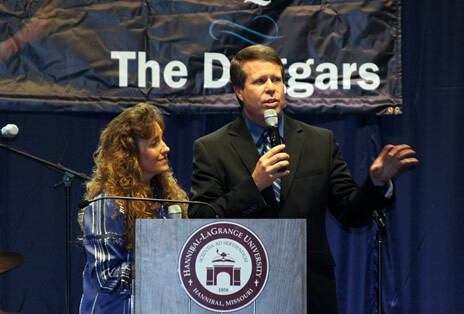 Sharing their testimony on how their family started, the Duggars said that Michelle had been on a birth control pill for the first three and a half years of their marriage. She then went off it and had their firstborn, Joshua. Following his birth Michelle went back on the pill only to get pregnant again and wind up losing the baby. They then found out that the pill she was on was abortive in nature. Then Jim Bob joined her and together they repeated “and another one and another one…” drawing laughter from the audience. The road hasn’t always been easy for the Duggars, but they were trusting in the Lord and following His plan for their lives so “in faith, we kept going” said Jim Bob. The Duggars also shared many sincere and uplifting words of encouragement to spouses and parents on expectations, reality, anger, a soft word turning away wrath, praising children, and the Lord’s provision for their family. Their lives changed forever when one day they happened to be in town during a protest against partial birth abortion at the state capitol. A ban against partial birth abortions was voted down that day and Jim Bob felt God impressing upon him to run for state representative, a race that he won. Their family held rallies and barbeques and even sold their house and used half the money for the campaign. In all of this though, they had not felt God telling them that they were going to win the race. On the day of the election they took their then 13 kids to the poll as a learning experience for them. That night he lost but they rallied together and prayed, thanking God for the experience and saying that they were ready for whatever came next for them. The show was so popular that the producers came back to ask to do another show and another one because they kept being so successful. Eleven years and over 200 shows later, 19 Kids and Counting is now the highest rated show on TLC. God has opened many doors for the Duggars to share that children are a blessing from the Lord. To date they have been featured on five Discovery Health and TLC documentaries entitled, 14 Children and Pregnant Again!, 16 Children and Moving In!, Raising 16 Children!, On the Road with 16 Children! and Duggar’s Big Family Album. Jim Bob and Michelle Duggar married July 21st, 1984. To date they have been blessed with 19 children, (10 boys and 9 girls) Joshua (and wife Anna), Jana and John-David (twins), Jill (and husband Derick), Jessa (and husband Ben), Jinger, Joseph, Josiah, Joy-Anna, Jedidiah and Jeremiah (twins), Jason, James, Justin, Jackson, Johannah, Jennifer, Jordyn-Grace Makiya, and Josie Brooklyn. Prior to the Duggars’ message, those in attendance at the banquet also had the opportunity to hear testimonies from two HLGU students, Amanda Martin and Ryan Pickering. HLGU’s ministry team Praise Song performed three songs following the student testimonies, All my fountains, Oceans, and an a Capella arrangement of My Ransom and Jesus Paid it All. All in all, an enjoyable evening was had by all in attendance. Next year’s banquet will be held on Friday, November 20, 2015. For more information about HLGU’s annual Booster Banquet please contact Director of Alumni Services and Institutional Advancement, Lauren Youse at 573.629.3126 or via email at lauren.youse@hlg.edu.